One of the primary reasons why vintage Rolex collectors gravitate towards the reference 1675 GMT-Master is the wide range of bezel insert colors that can be found on surviving examples of this historic, multi-time-zone-displaying, pilot’s watch. Rolex manufactured bezel inserts for the reference 1675 GMT-Master in a number of different colors; however over the decades, these inserts have all faded slightly differently, leaving an impressive assortment of varying hues behind. This GMT-Master 1675 has a Faded Bezel Inserts that was lost its color over time, but some people value it all the more. Originally introduced in 1959, the reference 1675 GMT-Master experienced a relatively long production run, and Rolex continued to manufacture reference 1675 watches until 1980. During this time (and for a number of years thereafter due to the production of service replacement parts), reference 1675 GMT-Master bezel inserts were manufactured in red/blue, black, brown, brown/gold, and blue – the all-blue, “Blueberry” insert being a non-standard option that was reserved for special orders during the 1970s. 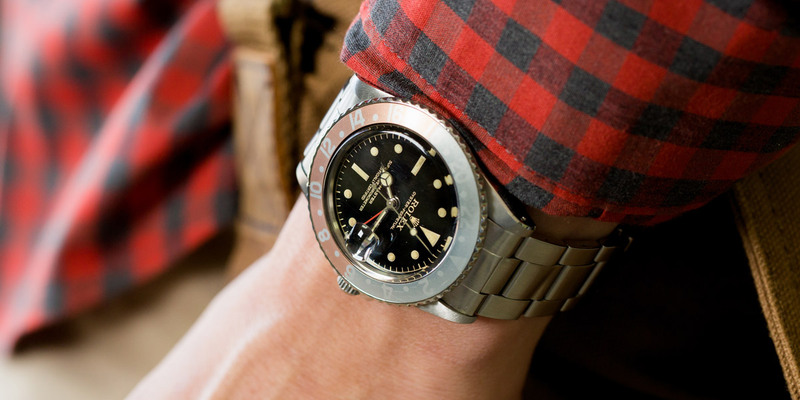 However, the manufacturing process for reference 1675 bezel inserts was not entirely symmetrical throughout the lengthy span of their production, and due to a number of small changes that took place over the course of multiple decades, two originally-identical bezel inserts can fade to completely different colors after years of continuous wear and use. Additionally, not all reference 1675 GMT-Master watches received the same type of use or were exposed to the same environmental factors. An insert that frequently came into contact with salt water is likely to fade differently than one that was subjected to heavy sunlight exposure. Furthermore, a bezel that is rotated frequently is likely to fade more quickly and less symmetrically than one that is seldom turned at all. The infinite variability in the different patterns and circumstances of wear/use compounds the number of possible hues that can exist, and guarantees that no two bezel inserts will be entirely identical once they begin to fade and change color. Depending on the watch, the smallest features can make a watch sky-rocket in price. 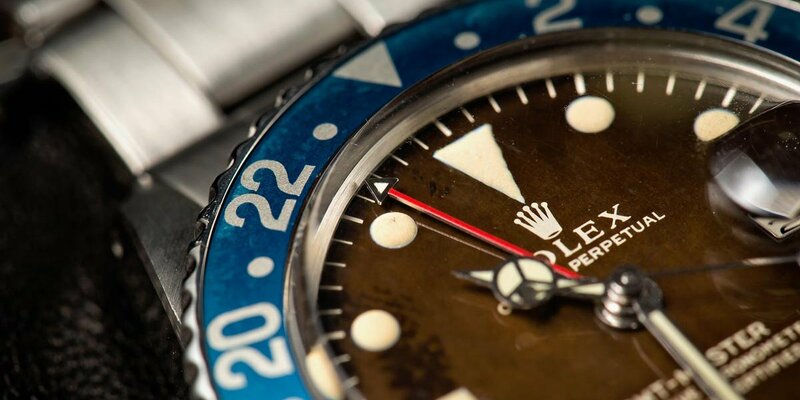 The aesthetic nuances that faded bezel inserts bring to the overall appearance of a watch are a huge part of their appeal to vintage Rolex collectors. However, an additional reason why collectors appreciate faded bezel inserts on the reference 1675 GMT-Master like the Blueberry is that they often speak to the originality of the bezel, and are a reflection of the life that specific watch has lived. There is no way to polish aluminum bezel inserts to their original appearance, so any fading, marks, or scratches will be permanent; their collective sum serving as an unofficial history of the watch and the unique history that it has experienced. The classic, red and blue, “Pepsi” bezel insert for the GMT-Master can fade to a remarkably wide range of colors. The bright red can change to anything from a pastel pink to a vivid magenta, while the royal blue takes on a hue that can vary from pale gray to a summer noon sky. Even the all-black, reference 1675 bezel inserts can change to a surprisingly wide array of colors once they thoroughly fade. Surviving examples can be found in tones that fall anywhere between navy blue and gunmetal grey. In some cases some bezels have lost a large amount of color. The signature feature of Rolex’s GMT-Master line has always been its colorful bezel. 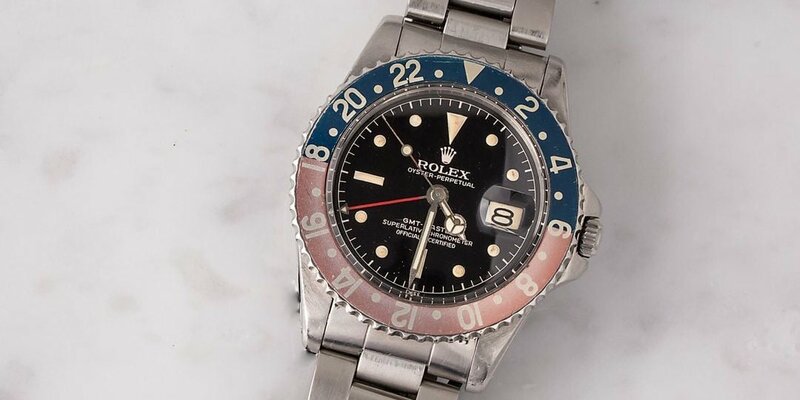 Back in 1954 when the line of watches was first released, the GMT’s bright, almost whimsical, red and blue bezel insert was the key feature that instantly created a visual distinction between it and Rolex’s similarly styled, Submariner dive watch. Consequently, it seems only fitting that a large part of the interest and excitement that surrounds the vintage reference 1675 GMT-Master today is focused upon the impressive range of colors that can reveal themselves when the bezel inserts start to fade over the years. Although mint-condition bezel inserts will always have their rightful place within the world of vintage watch collecting, a large part of the appeal of Rolex’s reference 1675 GMT-Master is the remarkable assortment of colors in which faded bezel inserts can be found. A faded bezel insert is certainly not going to be to everyone’s aesthetic preference; however some would argue that it is almost an integral component to the overall love and appreciation for the reference 1675.